Earth Day Pt. 2 – I stumbled across a link for the Hostel In The Forest during an online visit to Lafayette, LA’s Blue Moon Guesthouse. 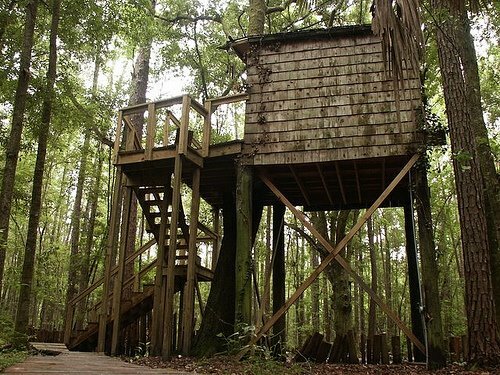 Sleep in a treehouse for just $25 per night! “The Hostel in the Forest has operated as an International Youth Hostel for 32 years. We are world renowned for our geodesic domes and 9 tree houses, which were built and have been sustained entirely by volunteers. Hundreds of loving hands have gone into making the Hostel what it is today, a fact that is evident as soon as one steps on the property. The Hostel sits on 120 acres of forest and wetlands, 2 miles from H.W.95 in Brunswick, Georgia. It is located short distances from the famous ‘Golden Isles’ of St. Simons Island and Jekyll Island. There are also many pristine coastal barrier islands including the famous Cumberland National Seashore close by. The property also has a bunch of gardens and a sweat lodge. The Hostel is hosting a yoga retreat May 1 – 3. For more info click here. Namaste!